An area down the driveway was designated as a more appropriate patch, and all my plants were moved there. So far they've not gone forth and multiplied too much. Again the soil is infertile and inclined to be dry, and their beautiful white flowers brighten up this shady spot, though they aren't happy in autumn droughts. Did I in all innocence think I'd managed to remove all those roots? 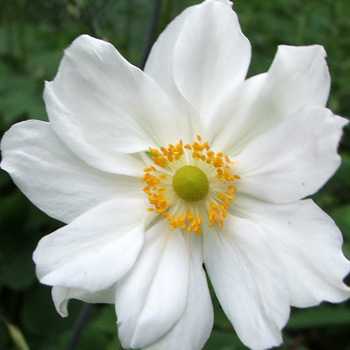 Because now, in 2010, I have a thriving patch of white Japanese Anemones in that original planting place. They are quite delightful from late summer on, particularly when their flowering stems are infiltrated by a pale blue aster. 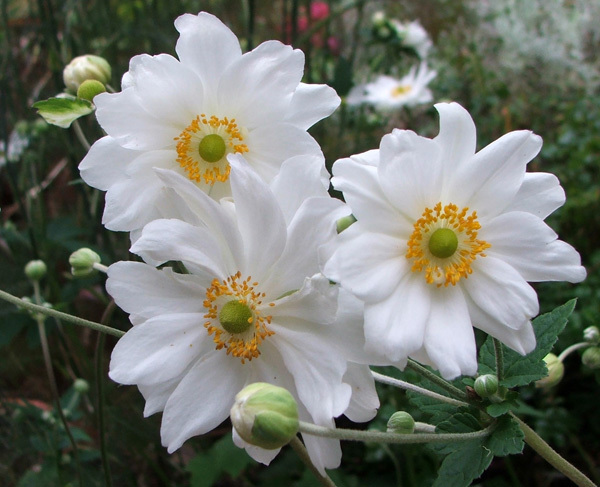 And provided I keep up my watering regime I have masses of beautiful white flowers. Nobody has the nerve to call this pretty flower 'invasive', though. Hmm... Any gardeners who need to be totally in control of their perennials should be very, very wary.